(Natural News) Remember the Toronto “white van” terrorism attack a few days ago that killed 10 people and injured many more? According to the fake news media, the van did all the driving and ran over people all by itself. The reason the media is reporting this, of course, is because when terrorism is carried out by people with foreign-sounding names, the dumbed-down liberal media immediately shifts blame to the vehicle rather than the driver. The suspect, Alek Minassian, has yet to be labeled a “terrorist” and of course, Canadian authorities are reluctant to call it a “terrorist attack.” But that is despite the fact that Islamic terrorists have resorted to using vehicles to mow people over as opposed to using firearms as their weapon of choice — especially in countries where gun laws prevent private ownership of guns. Instead of pointing the finger at Islamists, CNN, CBC and the New York Times all published headlines that served to hide the true nature of the attack. CBC reported, “Children feared killed in Nice as truck attacks family event”. Presumably, the truck was somehow able to manifest artificial intelligence and plough itself through dozens of victims. 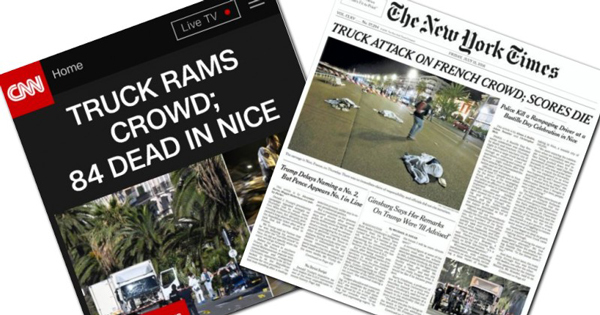 Not to be outdone, CNN reported “Truck rams crowd; 84 dead in Nice,” again providing a convenient way of avoiding any mention of the ideology that inspired the driver. The New York Times went with “Truck attack on French crowd; Scores die,” again pinning the blame on the vehicle rather than the Islamist inside it. Contrast all this with the vehicular murder that took place in Charlottesville, where an apparent neo-Nazi asshat rammed his vehicle into a crowd of people, killing one. This attack was instantly blamed solely on the driver and his ideology, not the vehicle. If the driver is “right-wing” or neo-Nazi, the DRIVER is at fault, and before long it’s Trump’s fault, too. If the driver is Muslim or foreign-sounding, the VEHICLE is at fault, and the driver is given a pass by the corporate-run media. All the fake news and cover-ups coming out of the legacy media motivated me to create the following animation, where van attacks are fully explained by CNN. View, laugh and share widely. Hurry, they’ll ban this the minute it becomes popular. See lots more videos at Counterthink.com.